A group of friends decide to go out to the movies. Fred and Tom are bringing dates, while their 2 friends are going alone. When the friends arrive at the movie theater, they find a row of six seats so they can all sit together. If Fred and Tom must sit next to their dates, how many different ways can the group sit down? Think of the seats as an arrangement of people in a line. Fred and Tom must sit next to their dates, so you can treat the pair as a single object. The only difference is that we must then multiply by 2, since we can switch the order in which they sit down at will (either Fred or his date can sit on the left). So instead of dealing with 6 objects, we now simply work with 4. An arrangement of 4 objects, can be made in different ways. You can choose any of 4 objects to be in the first spot. Once that spot is taken, you move onto the next of four spots. You place any of the remaining three there, giving you 3 more choices (or multiplying by 3). You do the same thing 2 more times to end up with 24 possibilities. There are seven unique placemats around a circular table. How many different orders of placemats are possible? Since the table is circular, you need to find the total number of orders and divide this number by 7. The total number of different orders that the placemats could be set in is 7! (7 factorial). For a certain lunch special, customers must order a salad, an entree, and a dessert. If there are three different salads, four different entrees, and two different desserts available, then how many different lunch specials are possible? Customers must choose a salad, an entree, and a dessert. There are three different salads, four entrees, and two desserts. The simplest way of determining the number of combinations is by multiplying the number of options for each part of the meal. In other words, we can find the product of 3, 4, and 2, which would give us 24. Sometimes, if you can't think of a way to mathetimatically determine all of the different combinations of something, it helps to write out as many as you can. Let's write out all of the possible cominbations just to verify that there are 24. Let's call the different salads S1, S2, and S3. We will call the four entrees E1, E2, E3, and E4, and we will call the desserts D1 and D2. There are five pictures but only four display cases. The display cases are unique. How many different arrangements of pictures in display cases can be created? There are five possible choices for the first space. For the second there are four possible, three for the third, and two for the fourth. 5 * 4 * 3 * 2 = 120 possible arrangements. Ernie has 4 shirts, 7 ties, and 3 pants. How many different possible outfits can Ernie make? The purpose of this question is to understand how to calculate a number of combinations. All different combinations of clothing articles are equally possible. Since all combinations are possible, the numbers of articles of clothing are all multiplied together, , yielding 84 different possible outfits. Gihani has six clean shirt and four pairs of pants to choose from. How many possible combinations of outfits can she make with these items? If she has six shirts and four pairs of pants, then the total number of options she has can be found by multiplication. To double check, you can create a tree diagram, listing the possible combinations. How many ways can a route be drawn that goes from Point A, to Point B, to Point C, then point A again, in that order? 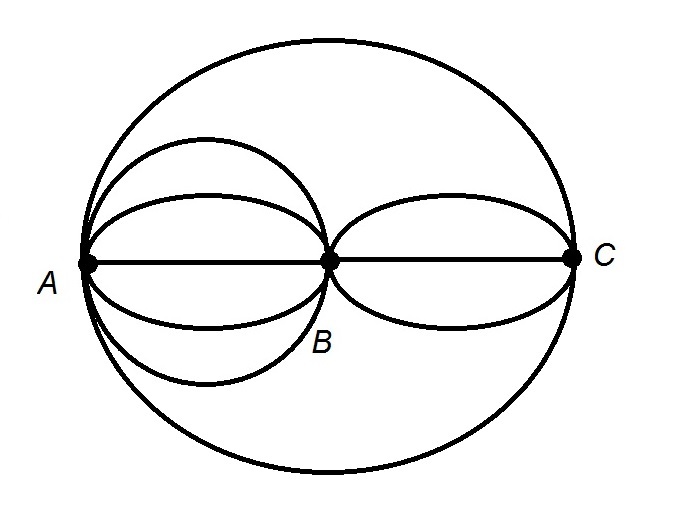 How many different routes can be drawn that begin at Point A, then pass through, in order, Points B, C, A, B, C, and back to A, if no path between two points can be traveled twice? 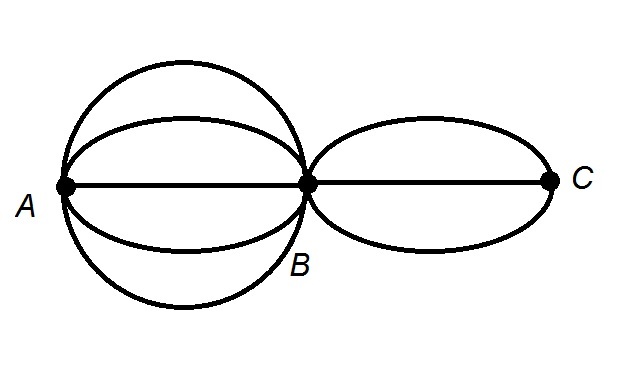 How many ways can a route be drawn that goes from Point A, through Point B, to Point C, then back through Point B, and back to Point A? Any path between points can be taken twice. Westchester Community College, Associates, Mathematics. Univerity of Arizona, Current Undergrad, French.